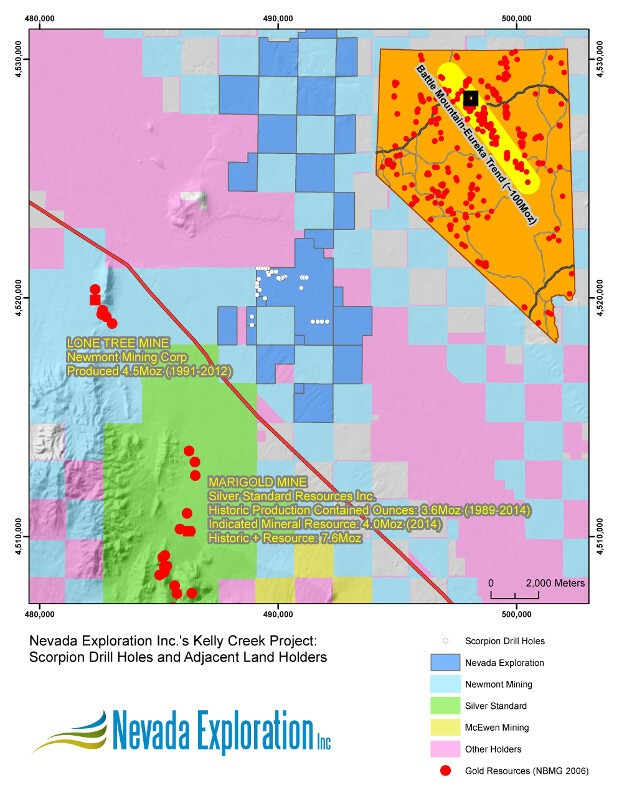 Nevada Exploration Inc. is very pleased to announce that it has completed 36 Scorpion drill holes totalling more than 2,600 metres (8,600 feet) at its Kelly Creek Project located along the Battle Mountain-Eureka Trend in north-central Nevada, and that the preliminary results indicate that vectoring using gold and related geochemistry in the groundwater at the Project is leading to increasing gold and related geochemistry in the bedrock and alluvium. Further to the Company's news release dated February 6, 2017, NGE is using its Scorpion Drill Rig to evaluate several mineralized, structurally controlled, shallow bedrock targets extending north under cover from Silver Standard's Marigold Mine. The objective of this stage of NGE's exploration program is to map the gold and related geochemistry found in the bedrock, alluvial cover, and groundwater at these targets, and to vector towards one or more mineralized footprints large enough to be associated with a major gold deposit. Discussing the results, NGE's CEO, Wade Hodges: "We're very excited to share the news that the early results of our Scorpion drilling program at Kelly Creek confirm that we are focusing in on a number of shallow bedrock targets by following increasing concentrations of gold in all three of: the bedrock, the alluvial cover, and the groundwater. This is exactly what we designed this phase of the program to accomplish. We are exploring in the middle of the Kelly Creek Basin, one of the most mineralized valleys in the heart of the world's highest gold producing jurisdiction by area. With our comprehensive and systematic under-cover toolbox, which includes our Scorpion Drill Rig, we are vectoring into the caliber of high-quality exploration targets that the industry is in desperate need of, and doing so more than 5 kilometres (3 miles) from the nearest outcrop. Our ongoing work at Kelly Creek provides a terrific example of the power of our integrated exploration program to lead the industry to open up the under-cover search space in Nevada."